>Large corporate capitalism is a breed apart from smaller scale capitalism. The former can often avoid marketplace verdicts through corporate welfare, strip owner-shareholders of power over the top company bosses and offload the cost of their pollution, tax escapes and other "externalities" onto the backs of innocent people. Always evolving to evade the theoretically touted disciplines of market competition, efficiency and productivity, corporate capitalism has been an innovative machine for oppression. Take productive use of capital and its corollary that government wastes money. Apple Inc. is spending $130 billion of its retained profits on a capital return program, $90 billion of which it will use to repurchase its own stock through 2015. Apple executives do this to avoid paying dividends to shareholders and instead strive to prop up the stock price and the value of the bosses' lucrative stock options. The problem is that the surveys about the impact of stock buybacks show they often do nothing or very little to increase shareholder value over the long run. But they do take money away from research and development. And consumer prices rarely, if ever, drop because of stock buybacks. Apple's recent iPhone is produced by 300,000 low-paid Chinese workers employed by the Foxconn Technology Group. They are lucky to be paid $2 per hour for their long work weeks. It would take $5.2 billion a year to pay these Chinese iPhone workers about $10 per hour. If the $130 billion from Apple's capital return program was put into a foundation, it could pay out, at 4% interest, $5.2 billion year after year. Compare $130 billion of "dead money" to the $1 billion in "live money" Tesla Motors has spent on research and development to produce its revolutionary electric cars. Forget marketplace competition when it comes to the abuse of the monopoly patent system for medicines, steeped in taxpayer-funded basic research, and its obsolete rationale for encouraging innovation. Welcome to the $1,000 pill -- yes the price of Gilead Sciences latest drug, Sovaldi, which is used to treat hepatitis C, a liver-destroying virus. It is said to have fewer side effects and a higher cure rate than its counterparts. Taken daily at a cost of $1,000 a pill, the 12-week treatment that is recommended for most patients costs $84,000 and a 24-week course of treatment for the hard-to-treat strain costs or $168,000. Use of this drug is beginning to break the budgets of the insurance company payers. Representatives from Doctors Without Borders has said that a 12-week course of treatment should cost no more than $500. Gilead did not sweat out the research and development of this drug. Gilead simply bought Pharmasset -- the company with the patent on this drug. Not surprisingly, Gilead stock has surged upward, oblivious to surging public criticism. Some overseas countries are not so submissive to the "pay or die" corporate edict. The nonprofit group I-MAK (Initiative for Medicines, Access and Knowledge) has filed a challenge to the patent, claiming that Sovaldi is based on "old science" with "a known compound," thereby not meeting India's stringent requirements for patentability. Additionally, economist Jamie Love has developed an alternative to such "pay or die" patent monopoly prices while keeping rewards for true innovations. Another example of corporate greed and waste is the astounding story of the White House trying to procure the replacement of is aging presidential helicopter fleet, which further undermines the myth that big corporations are more efficient than government. Under the George W. Bush administration, the Navy put in an order for 23 new helicopters from AgustaWestland, working with Bell Helicopter and Lockheed Martin. The price in 2005 was to be $4.2 billion. Three years later the price of the contract zoomed to $11.2 billion or $400 million per helicopter (about the price of an Air Force One 747). Congress's Government Accountability Office (GAO) and the Air Force criticized the contractors and their subcontracting practices. As is usual, Lockheed complained that the cost overruns were due to government modifications. In June 2009, the Navy terminated the contract after spending $4.4 billion and taking delivery of only nine of these (VH-71) helicopters. By December 2009, the White House and the Department of Defense officials washed their hands of this debacle. By that time, the projected cost had risen to $13 billion. In total, the bungled enterprise wasted $3.2 billion and this presidential procurement effort has to start all over again. By comparison, $3.2 billion is greater than the combined budgets of Americorps, Public Broadcasting, public housing (Choice Neighborhoods), the Arts (NEA), the Humanities (NEH), the Peace Corps and the worker safety programs of OSHA. Imagine if there was similar squandering of those budgets: there would be indignation roaring from Congress! When it comes to the defense industry, well that's just business as usual, complete with the golden handshakes with the Pentagon for the almost certain cost over-runs. 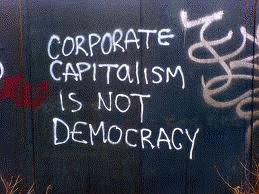 Big corporations should not be allowed the myths of competitive, productive, efficient capitalism -- unless they can prove it.